Did you miss out on Slipknot’s live release, Day Of The Gusano: Live In Mexico, which dropped last October? Then this masterfully edited and produced concert video for ‘Before I Forget’ is guaranteed to make your day. It is sheer pleasure to watch and lets you almost breathe in the tour energy of Corey Taylor and Co. 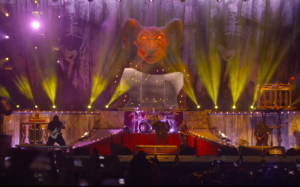 The documentary Day of The Gusano, which ‘Before I Forget’ is taken from, captures Knotfest Mexico City performances from Slipknot and delights with exquisite camera work and production. It celebrates the band’s 20-year legacy and features songs from your favorite Slipknot albums. You can get Day Of The Gusano in any physical or digital format here. As to what Slipknot are up to in 2018, you’ll be happy to know the band has been working on their new album, which they’re planning to release next year. And if besides googling Corey Taylor, you also check out the news from other Slipknot members, then you’re as excited as we are to hear Joey Jordison’s band’s new album, Repulsion For Humanity, this summer. The drummer’s international band Sinsaenum is set to release the new record on August 10. In the meantime, Sinsaenum are gearing up for their massive, first ever European tour. See the dates below and get your tickets at this location.